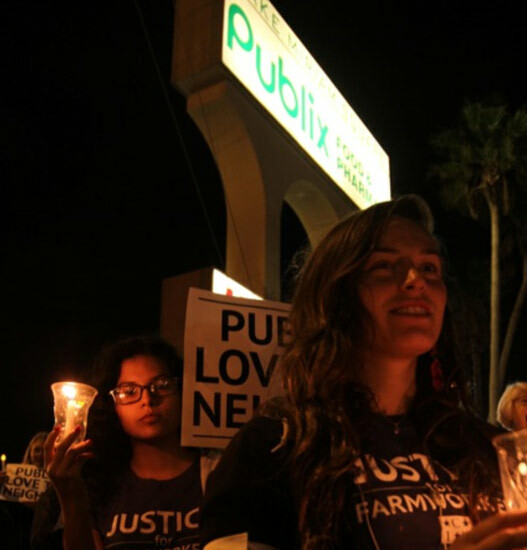 A Call to Action: Two dozen Sarasota area religious leaders, two former Sarasota mayors call for urgent community-wide assembly this Sunday at 3:30, march and delegation to Publix store where pastor banned for supporting CIW! Ever since reporting two weeks ago on the removal (with police back-up, no less) and banning of the Rev. Clay Thomas from a Sarasota area Publix store — for the crime of ordering a sandwich while wearing a CIW t-shirt (“Minister kicked out of Publix in wake of labor protest,” 9/11/12) — the Sarasota Herald Tribune editorial page has been buzzing with condemnation of the grocery giant’s heavy-handed response to its customers’ support for Fair Food. After reading your Sept. 12 news report, I wonder if all shoppers at Publix are at risk wearing a T-shirt expressing one’s feelings on certain subjects? Is there a law against supporting Immokalee laborers? If I had been at the deli counter ordering a sandwich and saw Clay Thomas (the pastor of the church I attend) and shook his hand or gave him a hug, would the police have escorted me out as an accomplice? It’s always a pleasure to shop at Publix, but I am shocked and offended at the rude and bumptious way Pastor Clay Thomas was treated at Publix recently (“Minister kicked out of Publix in wake of labor protest,” Sept. 11 Herald-Tribune). I understand Publix didn’t like his shirt and what it stood for, and that caused the pugnacious response. Many people feel Publix could do a little, which would mean a lot to tomato pickers on slave wages. I guess I should ban myself for a year from shopping at Publix since I am in total sympathy for the cause. “On Saturday, Sept. 1, while ordering a sandwich at the Promenade Publix, the Rev. Clay Thomas, associate pastor at First Presbyterian Church, was denied his sandwich and served a trespass warning instead. Like many of us, the Rev. Thomas has supported the Coalition of Immokalee Workers (CIW) in calling on Publix Supermarkets to join the Fair Food Program, which is improving wages and working conditions for Florida tomato pickers. We have delivered letters to managers, marched, fasted and prayed. That Saturday, the Rev. Thomas merely stopped by to greet farmworkers and allies who had just finished a peaceful protest outside the store. But for Publix Corporate Labor Relations, this simple gesture of solidarity merited police back-up and a yearlong trespass warning, as reported in the Sept. 12 Herald-Tribune. “It is shameful that Publix would refuse to join such a proven, positive effort and would treat those who support this program with such disrespect, particularly given Publix’s long-standing support of programs that foster well-being in the Florida community. • We stand with Florida’s farm laborers in their quest for justice. • We stand against slavery, abuse and poverty wages. • We implore Publix to reverse its current position and “do the right thing,” a core value espoused by Publix, by joining the Fair Food Program. We the undersigned invite you to join us and CIW farmworkers at St. Martha Catholic Church, 200 N. Orange Ave., at 3:30 pm this Sunday. Following a brief gathering we will, in the words of Rabbi Abraham Joshua Heschel, “pray with our feet” as we proceed to the Promenade Publix on 10th Street for a peaceful witness. Our witness will conclude with a clergy delegation to the store. What are you doing this Sunday at 3:30? Will you join them, and workers from Immokalee, in “praying with your feet” to let Publix know that Rev. Thomas is not alone, that our faith in justice will not waiver? CIW chosen as honoree of the 2012 Food Sovereignty Prize! Food movement leaders speak: Stop the Chipocrisy!